People tend to assume that body language just expresses how we feel inside. But it also works the other way: how we hold our bodies affects how we feel and think in all sorts of fascinating ways. One of the early studies found that people who put pens in their mouths in such a way that it activates the muscles responsible for smiling, actually experienced more pleasure. In the past few years the study of how bodily posture affects the mind has exploded. Here are 8 of the latest psychological studies on what psychologists call ’embodied cognition’, or the intimate ways in which body feeds back to mind. Feeling powerful can be useful but too much power can have a weird effect on decision-making. Just look at bankers: they got too full of themselves and never questioned their decisions. And we all know how that turned out. If you just want your decisions confirmed, then a feeling of power is good. But if you want to incorporate new information to make better decisions, then a feeling of power can be dangerous. One study found that when people adopted more neutral poses, like keeping their hands relaxed, they were more likely to take into account new information into their decision-making (Fischer et al., 2011). Powerful, expansive bodily postures, on the other hand, made people only notice information that was consistent with the decision they wanted to make. There’s little doubt that people tend to associated lower voices with more power. It’s no accident that those voice-over guys that do the movie trailers sound like they’ve been gargling scotch and razors for several decades. As you’d expect, then, when people lower their voices, they feel more powerful. But it also has another effect: it makes people think more abstractly (Stel et al., 2011). And abstract thinking can be important in a number of ways: it can boost creativity, self-control and increase self-insight. In fact, abstract thought is powerful in all sorts of ways; check out this article on psychological distance for more. To boost creativity, sometimes it pays for mind and body to be out of sync, according to a study by Huang and Galinsky (2011). They had some people recalling a happy time in their life while at the same time frowning. Another group recalled sad memories while smiling. The idea was to get their minds going one way and their bodies going the other. Participants who did this displayed more expansive thinking than those whose minds and bodies were congruent. Expansive thinking is very useful in the early stages of the creative process. It allows two previously unconnected ideas to be brought together in new and exciting ways. Pain is highly subjective and open to influence by psychological factors. Bohns and Wiltermuth (2012), therefore, wondered if people’s pain tolerance could be increased if they changed their posture, and therefore their mindset. Some participants in the study stood with their arms outstretched and legs wide apart, before taking a pain tolerance test. When compared with those standing neutrally or sitting submissively, those adopting the power pose could take more pain. This is because standing powerfully makes you feel like you have control over the pain, even if in reality you don’t. It’s well-worn advice, but no less useful because of that: when you go for an interview, make sure you stand tall…hold on, though, there’s a twist. In a study where participants went through a mock interview, it was those who adopted expansive, high-power postures, like standing tall, who made the better impression on interviewers and more likely to be chosen for the job (Cuddy et al., 2012). The twist is that they had to use the power postures before they went in for the interview, not during it. Adopting power postures during the interview had no effect. So you’ve got to stand tall before you go in to get your mind in the right place. Note: psychologists have since found that ‘power posing’ is probably not a real effect. When others have tried to copy the original study, it has not proved possible to replicate it. People who are powerful tend to approach others rather than waiting to be approached. They also stand closer while talking and are more likely to invade the personal space of others. But, according to a study by Smith et al., (2013; in press), it also works the other way around: being forced to approach others makes you feel more powerful. In fact, participants in these studies didn’t have to physically move closer, they only had to imagine or visualise themselves as closer to get the effects. So, simply imagining yourself approaching other important people or objects, is enough to pump up your power. The researchers in this study tested the effect of how women dieters sat while they ate (Allen et al., 2013). Did they spread out and take up more space, or did they act in a more stereotypically ‘ladylike’ way, minimising the amount of space they took up? They found that women who were worried about their body shape, and who minimised the space they too up while seated, were more likely to eat less in comparison to those who ‘sat big’. The exact reverse results were seen for women who were not concerned about their body shapes. Then, those who sat big ate less. So, how much women eat can depend on the interaction between whether they ‘feel fat’ and how they sit. We tend to think of jumping as a consequence of joy, but why not make it the cause? 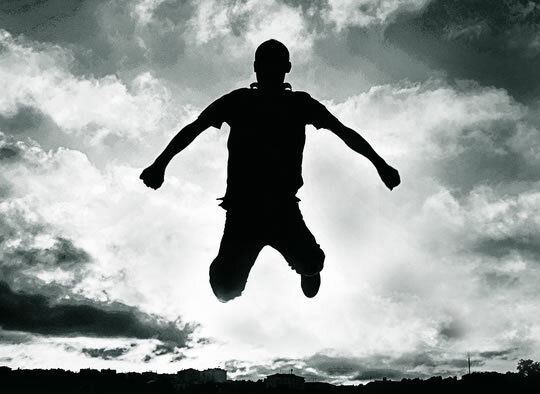 In a study by Shafir et al., (2013) people who jumped up and down felt happier than those who made neutral movements. In other words: it’s not just the joy of any movement, it’s specifically the joy of jumping up and down. And the jumping had to be actually done, just watching another person jumping didn’t work. A reminder, if it were required, of why dancing is fun and how movements we make with our bodies feed back to our emotions. → Want more? Then, check out 10 Simple Postures That Boost Performance.